These maps reflect the ratings of a number of quantitative and qualitative forecasters, as well as some consensus projections. Click or tap any of the thumbnails for an interactive version that you can use to create and share your own 2018 House forecast. A consensus outlook for the 2018 House elections based on the current ratings of Sabato's Crystal Ball, The Cook Political Report, and Inside Elections. For purposes of this map, only congressional districts rated safe by all three of these forecasters are shown in the darkest shade. Use this map as a starting point to create and share your own 2018 House forecast. New! View this forecast as a table. Based on the final ratings, the 83 'undecided' districts in the map below are rated 'toss-up', 'tilt' or 'leans' by at least one of Sabato's Crystal Ball, The Cook Political Report, and Inside Elections. The final 2018 House forecast from Sabato's Crystal Ball. Use this as a starting point to create and share your own 2018 House forecast. The final 2018 House forecast from Inside Elections. Use this as a starting point to create and share your own 2018 House forecast. The final 2018 House forecast from The Cook Political Report. Use this as a starting point to create and share your own 2018 House forecast. This is a House forecast map derived from district level probabilities calculated by the 0ptimus Election Model. The toss-up tan color is used when neither party has a 60% or higher chance of winning. Color gradients are used to show higher Democratic and Republican probabilities, deepening as the chance of winning increases: Light (60%+), Medium (75%+), Dark (90%+). 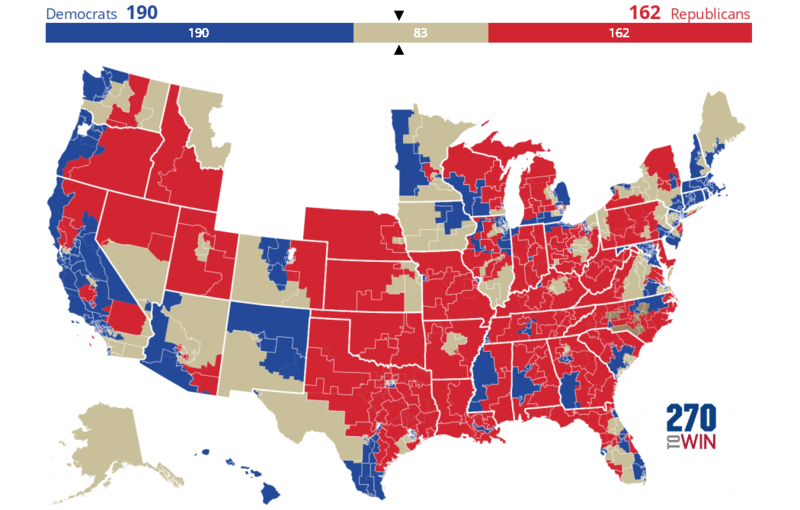 Use this map as a starting point to create and share your own 2018 House forecast. You can also view this forecast as a table. This is a House forecast map derived from the probabilities associated with the FiveThirtyEight House Forecast (Classic Version). The toss-up tan color is used when neither party has a 60% or higher chance of winning. Color gradients are used to show higher Democratic and Republican probabilities, deepening as the chance of winning increases: Leans (60%+), Likely (75%+), Safe (95%+). The map reflects the model output as of the timestamp below it. This is a House forecast map derived from G. Elliott Morris's district level probabilities published on his blog, The Crosstab. The toss-up tan color is used when neither party has a 60% or higher chance of winning. Color gradients are used to show higher Democratic and Republican probabilities, deepening as the chance of winning increases: Light (60%+), Medium (80%+), Dark (90%+). The final 2018 House forecast from Politico. Use this as a starting point to create and share your own 2018 House forecast. The final 2018 House Key Races forecast from CNN Politics. Use this as a starting point to create and share your own 2018 House forecast. The final 2018 House forecast from Daily Kos. Use this as a starting point to create and share your own 2018 House forecast.